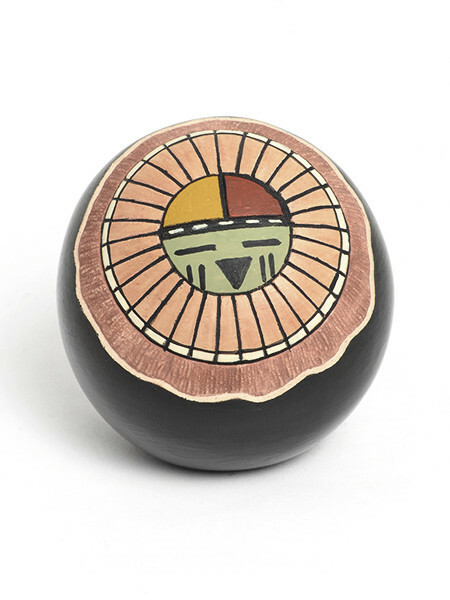 Pottery Sun by Lawrence Namoki (Hopi) Lawrence Namoki was born in 1949 and is a member of the Flute-Deer Clan. He has been active making pottery since 1983. Museum collections include: Museum of the American Indian- Smithsonian Institute, Washington, DC and the Royal Family Collection, London, England. 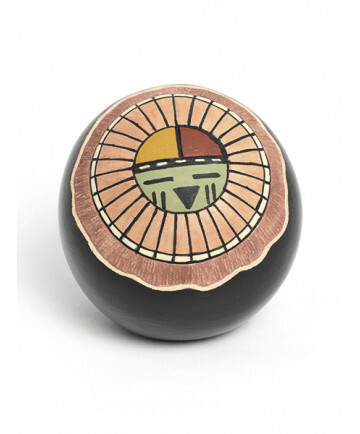 He is known for his incised and painted figural imagery depicting traditional Hopi stories and culture. This piece measures 3 1/2 inches tall by 11 1/2 inches in circumference. Approximate diameter measures 3 1/2 inches.